I guess we all can relate to the paragraph. Each of us faces our own sandstorm and often there is no one you can talk to or ask help to or any ask advised to and there's no other option but to just keep moving forward, step by step. Then, just when you think "I got this", suddenly you are inside yet another sandstorm. And it's like there's no end to it. And that is life. I learned to be okay with the neverending chase. The sandstorm sure is not easy. Like Haruki Murakami said, often there's no direction whatsoever but one thing for sure, we don't settle, we push through, people! the bag <3 <3 <3 <3 looks so lush!! Aw you look so gorgeous and girly! 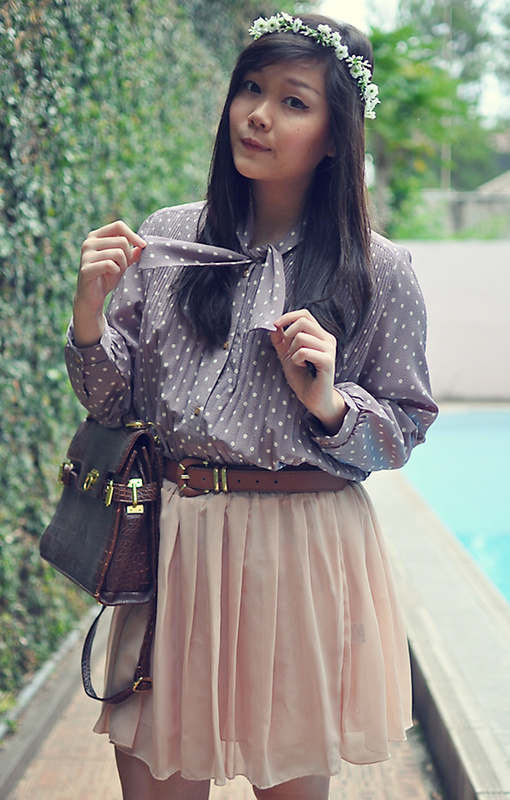 I love the subtle colors in this outfit. Your dotted top is super adorable. I wish I had one like it! :3 super duper cute shoes!!! awww love your shoes !! That paragraph totally captivated me - its so...beautiful! So true and meaningful. The storm inside us doesn't give us peace. u have so many cute outfits! The title of the book is Kafka on the shore? This sounds like a reference to the stranger and may be something I want to check out! OHH i love your vintage look <3 that shoes's so pretty! so agree. whatever happens, life goes on. whether we want or not, we have to through the path of our life. i need to read that book ! Those shoes are killer! i want them so badly! your shoes is very covetable! !